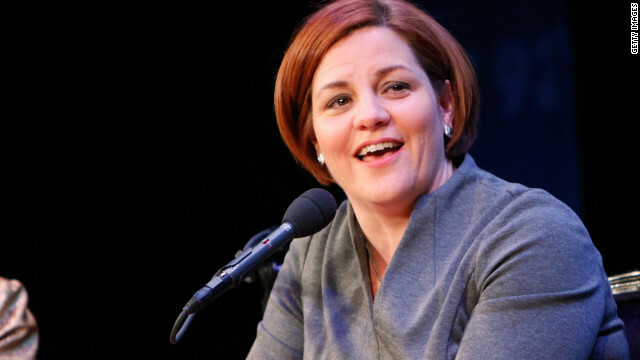 Live Tonight: Christine Quinn on "The Grill"
This evening at 9, "Piers Morgan Live" invites current Speaker of the New York City Council – and leading candidate in the upcoming New York City Mayoral election – Christine Quinn to take her place on "The Grill." As part of a live interview, Quinn will join host Piers Morgan to discuss her current lead in the race for NYC Mayor, her upcoming book, and various polarizing tpics that are dominating the current news cycle. In previous visits to the program, Quinn has touched upon everything from the New York City soda ban to Hurricane Sandy. Also tonight, Morgan will invite Chad Myers to share the latest as Tropical Storm Andrea comes ashore in the United States. Meanwhile, Glenn Greenwald, Alan Dershowitz and Senator Bernie Sanders will join the host to discuss the recently revealed NSA scandal. And tune in at 9 as we'll also meet the family of the South Carolina Valedictorian who asserted his right to practice religion during his graduation speech. Dear piers. I 63yr old woman on medicare for a work related back injury. I have had part A since 1996 and enrolled in part B in 2007. Prior to that I was insured under my now x-husband. I have always been healthy but now that I am getting older I decided it was time to look into extra coverage. In calling Medicare to my surprise I will be charged (for life) a late enrollment penalty on the part D coverage. The said that is because I should have enrolled when I started receiving the part B coverage I had only 63 days to be eligible. I have never needed medication other than maybe for a infection or flu. Because I maybe spend at max $100. a year I never even need to look into this. This penalty .3108 cents for ever month I was without the part D coverage. The penalty would be $23.30 per month + the monthly premium. The least inexpensive $20.per month, . This coverage will cost me $495 per year . Then I would have to meet the deductible $325. I am being forced to pay $820. for coverage I really don't need now. Instead of the $100 that I pay for medication. If I wait the penalty will just keep going up.I cant get any answer to why other than because to government said so. I am being penalties for been healthy, for making the best financial decision for myself. This is total abuse of the many senior in this country. I do not qualify for any assistance because I earn $34,000 a yr. You are great in getting answers for the right people. Sincerely Fran. HAVE A GREAT DAY. Piers Morgan is a liar...he just put words in Newt's mouth. He didn't say he didn't trust the Bush Administration. He said he didn't trust Big Government. Nobody has had a bigger government than Obama!!!! Any administration that has Tsars is not to be trusted. Piers shut up and listen to your guests. I don't understand why we are still talking about Benghazi. Yes it was a horrible thing that we weren't told the truth about what really happened and we just let it happen but I think the IRS scandal and more importantly the seizure of AP phone records are way more relevant and important. I mean would journalist want to make huge story about the AP seizures I haven't really heard anything about it on CNN except the first two days of it but Benghazi was what almost 9 months ago come on. I cannot believe Piers endorsed and applauded the killing of that mako shark – I have always admired him for his stance on gun control and other issues – but to applaud the killing of that mako shark makes me sick....I watch him most nights but will not any more.....Sharks are so important to the ocean environment and they need our protection! I have lost respect for CNN and Piers! This was the most insensitive and uninformed Piers show I have ever watched. It is well known that sharks are endangered and threatened worldwide. Your show treated the destruction of this magnificent animal as a carnival, to be applauded and ridiculed. You owe your viewers a reasoned and articulate apology, and .......... and a show that explains the status of sharks and the need for their protection. Why is CNN not covering the Bilderberg 2013 conference? Do I endorse the killing of Mako Sharks? Absolutely not. I'll still watch you Piers.